November 14, 2015 -- Immediate Past District Governor Gary Silah was awarded with a Birch-Sturm Fellowship by his fellow Lions of District 27-B1 at the District Convention held at the Paper Valley Hotel in Appleton. Presenting the plaque is Past District Governor Tom King, currently a Director of the Wisconsin Lions Foundation representing District B1. Lion Gary has recently completed a year as District Governor for the Lions district. Silah also received a Presidential Certificate of Appreciation from Lions International. He was this year's convention chairman and is also the diabetes chairman for the district. This is Silah's second fellowship. 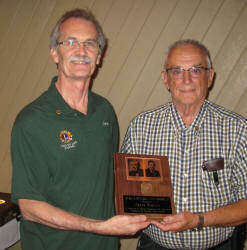 Frank Bartzen was presented with a Birch-Sturm Fellowship at a recent meeting of the Fond du Lac Evening Lions from PDG Gary Colton, Immediate Past President of the Birch-Sturm Memorial Fund and also a member of the Fond du Lac Evening Lions. Bartzen is a 42 year Charter Member of the Fond du Lac Evening Lions and a strong supporter of club functions. He is the chairman of the Sight and Hearing Committee that gives out glasses and hearing aids to needy individuals in our community. He also transports eye tissue for the Lions Eye Bank of Wisconsin. The Birch-Sturm Fellowship is awarded by the Wisconsin Lions Foundation upon receipt of a $1,000 donation to the foundation's memorial fund named after the two Lions Clubs International presidents from Wisconsin, Frank Birch (Milwaukee) 37-38 and Clarence Sturm (Manawa) 59-60. The foundation supports the Wisconsin Lions Camp in Rosholt where over 1,300 children and adults attend summer camp for a week absolutely free of charge via Lions and Lioness support. The camp specializes in blind, deaf, cognitively disabled and diabetic individuals. Other FDL Evening Lions that are Birch-Sturm Fellows are Wayne Bargenquast, Bob Berryman, Charles Browning, Tom Clausen, Gary Colton and Mike Konen.